Formerly the PLOUGH & HORSES to 1830. Address as 12 Cattlemarket until 1901. Closed April 1995 and continually monitored for damage as the Castle Mall development undermined the building. Offered for sale October 1997. 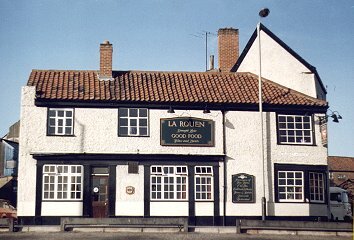 Reopened December 1999, renamed LE ROUEN. Originally two or three buildings, now converted into one. Party wall between two and three storey buildings breached to provide access to restaurant area. Fireplace with wooden over-mantle 17th or 18th C.
Wooden `Arts and Crafts ' type servery in restaurant area. Essentially modern but with reproduction period feel. Single bar has panelled bar counter with wooden bar back with fleur-de-lis stained glass in spandrels. Corner bar area partitioned off by a screen of turned wooden posts.